Strachan EyecarePlus offer professional and comprehensive eye and vision care for the whole family. We are dedicated to providing excellence in all our levels of service, with our focus being for you to see as clearly and comfortably as possible, and looking and feeling great in your eyewear! Greg and Sue Strachan have been providing the very best in personalised eye care to people in the local area since 1982, continuing the family tradition of Optometry – Greg’s father, John Strachan, ran a very successful specialist contact lens practice in Collins Street Melbourne for many years which has now merged with our Balwyn practice. Children’s Vision and Visually Related Learning Problems, including Developmental Visual Perceptual Assessments, and Vision Therapy programs. Good grades begin with good vision! Behavioural Optometry and Vision Therapy. Contact Lenses, including specialist custom-made lenses, OrthoK lenses for myopia control, as well as disposable one day, multifocal, coloured and overnight wear contact lenses. Change the way you see the world and how others see you! Strachan EyecarePlus Optometrists are accredited associates of laser vision centres situated in East Melbourne and St Kilda Road. We believe that “co-managed care” between us, your regular primary eye care providers, and specialist Ophthalmic surgeons, enables the best possible quality of eye care. Strachan EyecarePlus strongly supports Optometry Giving Sight or OGS. More than 600 million people around the world are blind or vision impaired simply because they do not have access to eye examinations and glasses. OGS targets this need, training local eye health professionals and providing low cost consultations and glasses to those who may otherwise remain visually impaired. At Strachan EyecarePlus we donate $2 from every pair of glasses sold to this fantastic charity. We have a collection box for ‘old’ glasses at each practice. These pre-loved glasses are used in overseas aid programs, so bring in any old glasses gathering dust in a drawer at home! 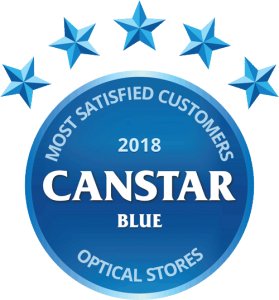 At Strachan EyecarePlus we are members of the EyecarePlus group, established by independent Optometrists of Australia to ensure strong combined buying power in order to be able to provide competitively priced optical appliances whilst maintaining the highest levels of clinical care. We stock an extensive range of quality fashion frames and sunglasses to suit all lifestyles, as well as a comprehensive range of prescriptable safety glasses and sports eyewear, together with a full range of eyewear accessories and contact lens products. We have an in-house lens fitting lab and use premium quality ophthalmic lenses. Our friendly trained staff will offer expert advice regarding both frame choice and the latest technology in lens design to ensure that your new spectacle lenses are giving you the best possible vision to suit your lifestyle needs as well as being as thin, light-weight and attractive as possible. And we will go that extra mile to find the perfect frame for you! Some of the exciting designer brands you will find at Strachan EyecarePlus include Face a Face, Tom Ford, Maui Jim, Coco Song, Bolon, Police, Prodesign, Escada, Oroton, Ted Baker, CK, Sass & Bide, Charlie Brown, Wayne Cooper, Carrera, Silhouette, Morrissey, Kliik, Nike, Adidas, Lacoste, Spine, Superflex and more! In addition we have our own exclusive range of HOME BRAND frames – great value and quality.